I flew this aircraft while working for Rocky Mountain Helicopters. I was flying in Seismic Oil exporation based in Killdeer, ND during the months of Jan and Feb 1981. The helicopter was almost new. It worked very well as a long line external load helicopter. 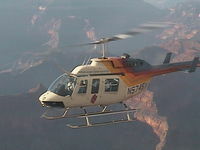 This helicopter, N5745Y, is shown on an episode of National Geographics "Earth: The Power of the Planet", "Rare Planet".